ARM has a problem – Cortex-A9 is old and the new Cortex-A15 cores just can't seem to make it to the market (the Exynos 5 Octa and Tegra 4 both have issues getting on shipping devices). The company just announced an interim solution, the Cortex-A12. It offers a 40% performance increase over the A9 and should bring some power saving to the table too. It supports big.LITTLE configurations so it can be paired with Cortex-A7 to improve power efficiency even further (whether it will work or not is another matter, the A15/A7 pairing doesn’t do too well). ARM's GPU line is in a similar spot – the new Mali-600 series really only shipped on the Google Nexus 10, most current chipsets rely either on a PowerVR GPU or an Adreno. 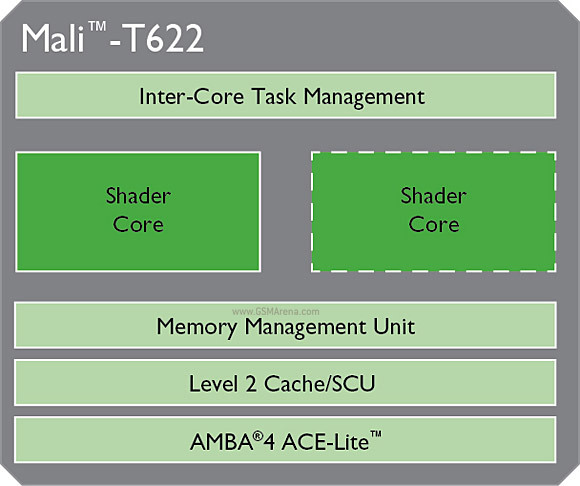 So, here comes the Mali-622, a mid-range GPU to go with Cortex-A12. It's an OpenGL ES 3.0, DirectX 11 and OpenCL 1.1 enabled GPU that promises 50% power-saving over the 604. A new video core was also introduced, the Mali-V500 can encode 1080p video at 60fps and decode 4K at 120fps given enough cores. Devices using the new generation mid-range chipsets using the Cortex-A12 and Mali-622 are expected in mid-2014. 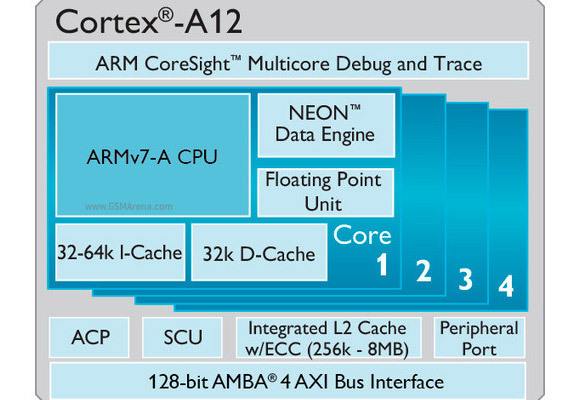 Performance is in this order ARM7 < ARM9 < ARM11 < ARM Cortex A5 < ARM Cortex A7 < ARM Cortex A8 < ARM Cortex A9 < ARM Cortex A12 < ARM Cortex A15. All the current generation of processors are based on 'Cortex' series.